Two Chinese diplomats have raised the possibility of Chinese military operations in Syria alongside the Assad regime. Speaking to Syrian pro-government daily Al-Watan on Thursday, China’s Ambassador to Damascus, Qi Qianjin, said that the Chinese military is willing to participate “in some way” alongside the Syrian Army in Idlib as well as other parts of Syria. 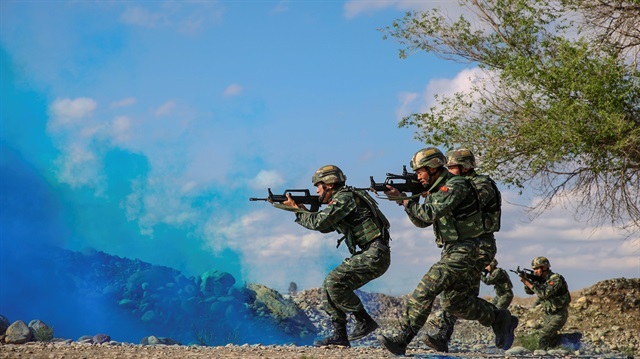 Additionally, Chinese military attaché Wong Roy Chang, in a similar statement also delivered to Al-Watan, reportedly stated that there is “ongoing” military cooperation between the two countries. “We, China, wish to develop our relations with the Syrian Army. As for participating in the Idlib operation, it requires a political decision,” Chang said. I think that China is looking to gain leverage over the US in an asymmetric fashion. Because they need some bullets in their gun to get Trump to back off the tariffs which are currently WRECKING the Chinese economy and stand as our best chance to strangle the Chinese military in it's teenage years...especially since we missed the chance to do it in the crib because of the idiocy with regard to "opening a new market" that stretches back to the Nixon era. So what will engaging in Syria bring them? A bargaining chip. For some parts of our govt the Syrian war seems beyond personal. If I didn't know better I'd think the fortunes of their families rests on certain outcomes being achieved. Militarily I still cannot understand the way the war is being fought and politically I can't understand the desire to fight the war till the very end. Regardless this will give China an opening. So what does this pronouncement from Diplomats mean? A warning shot across the administration's bow. This is a different way of saying back off the sanctions. If we can stay the course with sanctions we can break China's economic back. They built an entire economy based on exporting goods, taking advantage of a currency that they make artificially weak and have conspired with other govts to ship their good thru their nations to avoid illustrating the real trade deficit we have with them. Winning the trade war is.